From deep in our archives, we’ve found some parchment that says it was sent to Philadelphia papers in 1913, more than 100 years ago! It reads…. This morning, between midnight and dawn, Swarthmore’s St. Nick invaded nearly a hundred homes, and left behind him Christmas joy in the hearts of the children and Yuletide spirit in the hearts of the grown folks. But there is a secret about Swarthmore’s Santa which only the grown folks may know. If we follow the dear old white-whiskered fellow as he runs before the dawn to the last homes on his route, we discover that he spends an unusually long time in one little house set back from the road and covered with vines and Christmas holly. Then we begin to suspect something, and we follow him to this bungalow, which is really not as cold as we should expect it to be at the North Pole or not as full of scraps and shavings as we should think Santa’s workshop would be, and here we find that the white-whiskered old man in red cloak and boots has vanished, leaving in his stead a happy, laughing gentleman in regular clothes, who sits by the fire rater fatigued, drinking a cup of coffee, and telling his wife some of the funny things the children had said to old Santa. We recognize in him now a beloved citizen of Swarthmore, William W. Lesley. By his side is Miss Victoria Lesley, closely resembling the driver whom we saw by Santa’s side guiding the reindeers or holding them in check while St. Nick made his call. It is with deepest regret that Swarthmore learns that Mr. Lesley has travelled his Christmas course for the last time. “I am well beyond the half-century mark,” said Mr. Lesley, “and, though I am still healthy and strong as an ox, I want to see someone else play Santa.” For 27 years Santa Claus’ visit has been the feature of Swarthmore Christmas. 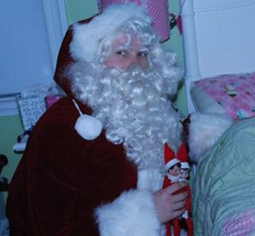 Once, 27 years ago, a Swarthmore woman induced Santa Claus Lesley to distribute the gifts to her children. Then another family begged him to visit their home, and year after year the custom has grown until nearly every family in the town looks forward expectantly to Santa’s coming. This year Mr. Lesley covered a route of nearly a hundred homes.